Yeah, you need to eat here. Orignally, I had planned to come to Comme Ça with my CTO (Chimp Training Officer) and Captain Cheddar at 9:00 AM that morning, since Comme Ca opened for Sunday brunch at that time, but those two wussed out, and we all agreed upon noon. 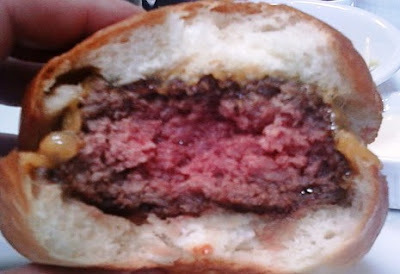 It was a $16 cheeseburger, and they assumed that we wanted them Med Rare--good for them. They also assume that we wanted a cabbage and onion slaw on it--bad for us. Get this on the side if you want to taste the burger. If you order it with slaw on the side, you get the burger on the left--if you read this and order it with the slaw--watch your back, Chachi. This was a truly fantastic burger. After the bad run of consistently lousy burgers, this burger seemed to have been flown in by angels. It was perfectly cooked, and it had a mighty, crusty, dark, well-seasoned sear, which yielded to reveal a juicy red interior of properly ground, not overly-fatty beef. The bun was little on the dry side, yet it did not quite contain all of the juices from this ball of joy. It the same sort of bun that you'd get at The West Branch or Olives, but it was not as perfectly executed. The cheese, Cheddar, and as one can see, it was perfectly melted over the patty to deliver uniformity. The burger did lack an end-note, but a dab of mustard or a sip of whiskey (CTO-style) solved that. Presumably, the slaw was to provide that, but that would have been a messy distraction. It came with fries, which were par-fried, thin, and overcooked, so they came out on the dry and dark side--they were also unseasoned. Who the hell cares--I could do without the fries at Umami and Five Guys, too. Burger Review : The next best thing to Umami Burger in a higher-end establishment and with a higher-end price tag. Want. Editor's Note: That was the old, and good Comme Ca. The new version with a different chef and VASTLY inferior ingredients was pig awful. 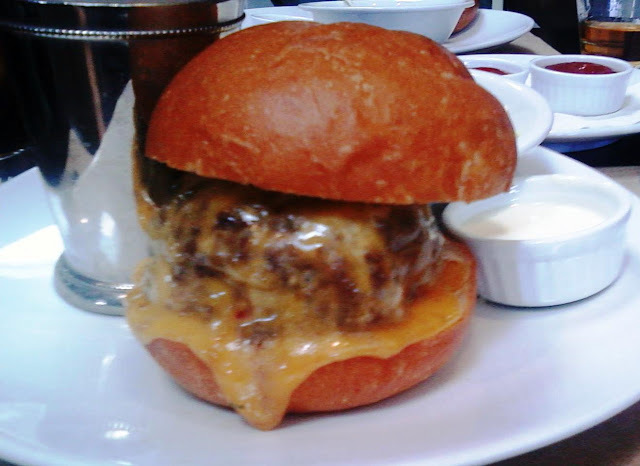 If you tried the old Comme Ca, then you had a truly marvelous burger. The latest iteration...PASS.